I've said it before, but I can't tell you enough how much we love cakes from our friend Kelly at "A Piece O' Cake." A birthday at our house, isn't the same without one of her amazing creations, and the cake we had yesterday for Maddie's 3rd birthday was no exception. If her cakes didn't taste so incredible, we'd have a hard time cutting into them - because they are so stinkin' cool! My favorite part is that we let Maddie decide what she wants for her cake. Well, this year she actually wanted a "Cindawella" cake, but we thought we'd wait a few years, until she can have a proper princess party with her little girlfriends. 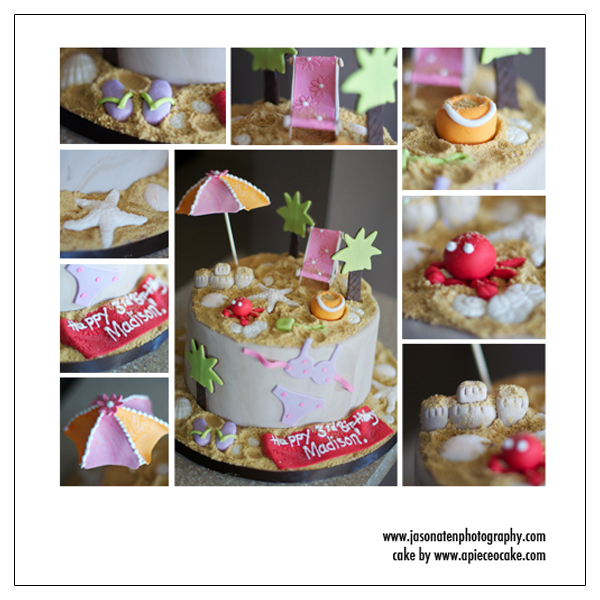 So her second choice was a beach cake! How fun. I love that I can send Kelly an email that says, use your creativity, but make it look like a day at the beach - and this is what we got! If you're getting married, having a birthday, or just like cake - you have to check her out! There's a reason she's one of our favorites!